2014 Season is coming, have any goals? Well the 2014 outdoor conventional pistol season will begin soon. Here in Georgia March will be our first match. Have any goals set you hope to achieve? And what have you done to prepare to meet them? I myself have two: Make Master and shoot 2600. So far, I have had my 1911, gone thru and have it running 100%, switched to this gun end of last season and was plagued by alibis. I have been doing some fine tuning on my reloaders and my loads. I have been shooting my 22 weekly at a indoor league. Soon as it warms up some I will be practicing on bringing up my average score on my nemesis the 50 yard target! Re: 2014 Season is coming, have any goals? Consistently shoot in the 700's. Make it to a match and get an official score. My other two goals are to break 2600 and clean a target at Perry. David have you ever noticed on a 50 foot SF target that if it's not a ten, it's a seven? 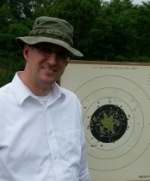 My main 2014 goal is to shoot expert scores with 22, then start shooting the bigger gun in CF and 45. Minor goal is get to RBGC a few times this season too. And Fort Benning to watch the rock stars. Brettitt41 wrote: Make it to a match and get an official score. Yeah, me too. That, and I am gonna try to get our club to get on the ball and do it for real. Clean a slow fire target. Shoot 10X on a short line target. Shoot 2600. Make Master. My goal is to stay relaxed and positive, not focus on my scores but on my groups. Concentrate on trigger control and never give up on a shot. Same here! Haven't shot in one yet. but starting out training, and hope to hit at least one up this year! My goal is to try and stay motivated as the last active BE shooter in my club. What does it mean to "cut the 50 yard range into bays"? Rob Kovach wrote: What does it mean to "cut the 50 yard range into bays"? Install berms to create multiple shooting bays. I was able to put my previously stated goals into practice yesterday at the Maine Indoor Sectional. Shot an 827-28x for third place. I got off to a shaky start but I maintained a positive attitude. Positive thoughts = positive results. My plan is to continue to work through the winter months and shoot my first 2700 since 1996 this spring! So long as the bullets, powder, and primers hold out I WILL make it!